Basil is one of the best herbs around to help fight inflammation. The eugenol compound found in basil gives it its distinctive flavor and aroma, as well as its inflammation-reducing properties. Basil has the ability to protect the DNA and it also has antibacterial properties. The active flavonoids found in basil helps protect the body’s cells. 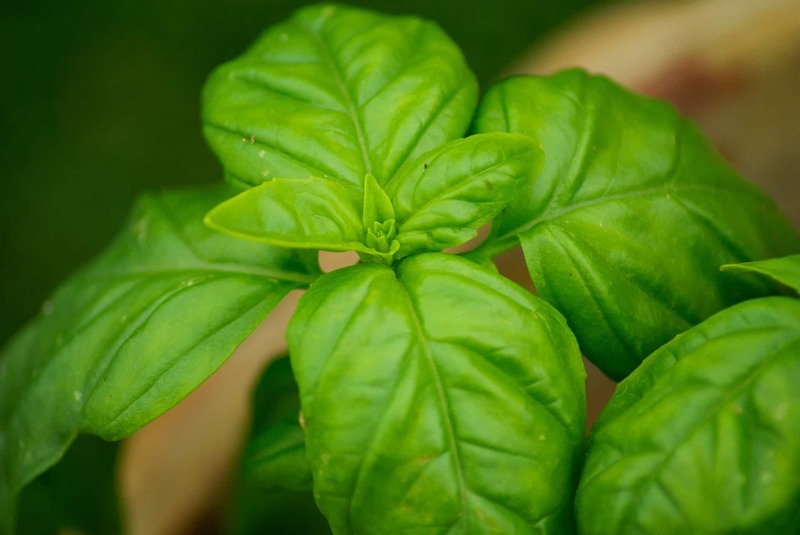 In addition, the two water-soluble flavonoids found in basil (orientin and vicenin) have been proven to protect cell structures and chromosomes from radiation and from oxygen-based damage. Also, basil has been proven to restrict the growth of a myriad of bacteria, including listeria, staphylociccus, and E-coli. Basil is a rich source of vitamin A, and it also is a good source for beta-carotene and other potent antioxidants that help protect the cells against free radical damage. These nutrients also help prevent the free radicals from oxidizing cholesterol in the blood stream, thus helping the body maintain a healthy cholesterol level. In addition, it also contains magnesium and promotes cardiovascular health by relaxing the muscles and blood vessels to improve your blood flow. Lastly, basil can also help lower your cholesterol levels and blood glucose (protecting you from diabetes). Basil has round, often pointed leaves that resemble those of peppermint. This herb is highly fragrant and its leaves are sometimes used to add seasoning to various dishes. This herb is often used in stress relief due to it containing phytochemicals, which studies suggest may reduce levels of the stress hormone cortisol. Basil’s aroma is also thought to elevate your mood. Thus, if you’re feeling tense, add some basil to either your water or iced tea. Make this concoction and apply it on your face to help even out your skin tone, as well as disinfect acne-prone or oily skin. Whatever culinary delight you may be coming up with, be it pesto or a simple sandwich, the burst of aroma that emanates from fresh basil has an almost magical ability to make you feel happy for no reason at all. This herb, native to India and having spread outwards to Europe and the Western World in the 16th century, is often used in traditional ceremonies. It’s used in ayurvedic medicine to cure problems like the common cold, headaches, stomach disorders, inflammation, heart disease, various forms of poisoning, and even malaria. This is all possible due to the antibacterial properties of basil. Last but not the least, it can be used as a good insect repellant.